I was back at my home parkrun this morning after a few weeks trekking the countryside and visiting some parkruns interstate and it was lovely to be home. The weather was typically Geelong-like – a bit nippy and overcast but perfectly suited for running without heat or glare. Having completed Melbourne marathon 10km last weekend and done no running all week, I didn’t really have a plan for today, just wanted to get out and run which is what I did. For only the second time ever (yes, ever), I ran 5km without walking. Same as last time, my overall time was slower than when I run/walk (which I find hilarious) but I felt really good, extremely happy and not at all as exhausted as I thought I would. It is a funny thing – this need I have to occasionally cut out walk breaks. They’re something I put in consciously, as per Jeff Galloway‘s program, to help me manage my dodgy achilles and push my distances out. However I also like to run it all every now and then to prove to myself that I can. It allows me to prove to myself (and the doubts that live in my head) that I run/walk because I choose to, not because I have to. So, another successful parkrun done and halfway to my 50 milestone. Right up until yesterday, I wasn’t sure that I was going to run in this event. My training had been going quite well, even while I was away on holiday, but my last run had been cut short by weird pains in my foot and twinges in my calf. My physio gave me the all clear (with a ‘take it easy’ caveat) but something didn’t feel right. Despite this, I trekked to Melbourne and checked in to my quirky accommodation – Melbourne Central YHA. I had an awesome room up on the roof and, after visiting the running expo at the MCG, I spent the afternoon and evening chilling out, trying not to stress out over my foot and stop myself from just going home. My alarm went off at 5.45am but I didn’t need it as I’d been awake half the night. It was weird to be nervous about a run – it’s not my first fun run, not a distance I wasn’t used to and not really a huge deal but the nerves were there anyway. I walked along to the MCG and found my friend Jo very easily, dropping off bags and we met up with the others from our running group. I still wasn’t really feeling it but was so grateful to be there with a group as their energy and positivity was infectious and got me to the start line. From there, it was just up to my foot as to whether I would make it to the finish. After various selfies, it was our turn to start so we wished each other all the best and set off at our own paces. I started slow, testing out my foot for any niggles and, with huge relief, found none. It appears the physio massage, rest and taping had done the trick. Spurred on by this fantastic news, I kept running steadily for the first few kilometres and felt really comfortable. I didn’t really need a walk break but something made me think of my leg so I decided to do intervals from then on although, in a sign of how good I felt, I kept running longer than intended on a few of my running bits. Getting to one of the drink stations (I think at around the 7km mark), there were huge cheers coming from the volunteers for all of us running past and it made me quite teary. It was one of those ‘I’m really going to finish this’ moments and I realised then that my nerves all along had been nerves about not finishing and feeling like I’d failed. It’s odd the pressures and expectations that we put on ourselves – they’re so much bigger than those that others put on us. Running up William Barak bridge was the only hill that gave me any challenge today although I remember it being a lot harder when I first ran this course 6 years ago so that made me feel better. 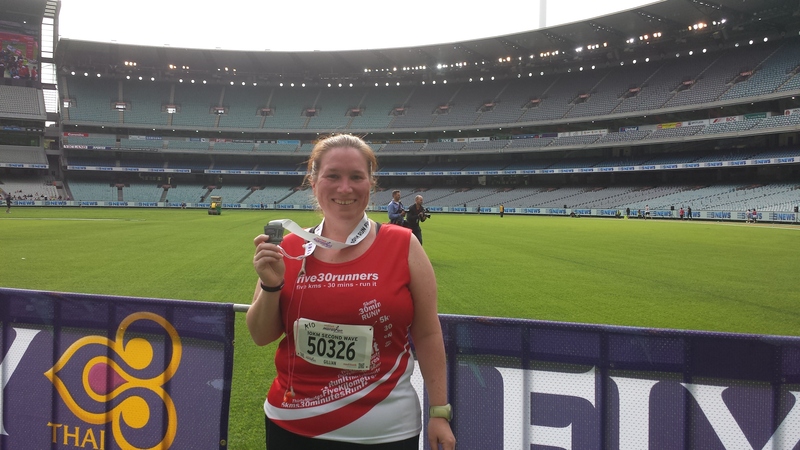 Most importantly, the MCG was clearly in view and we all knew what that meant – the finish line wasn’t far away. 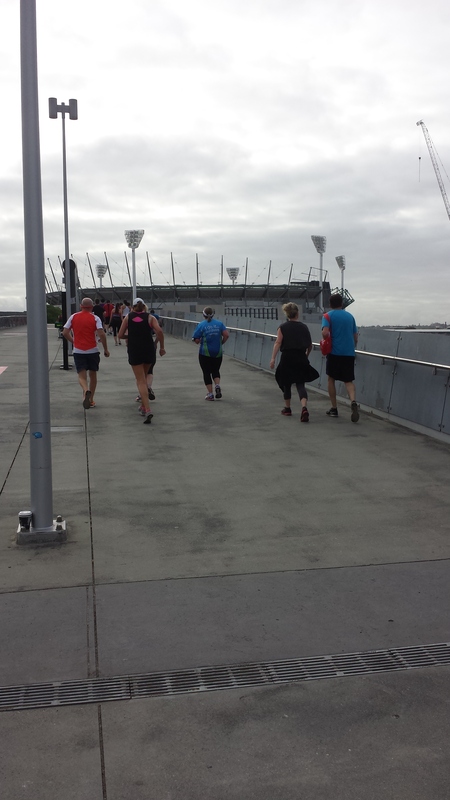 Probably the hardest bit is the loop you have to do to make up the distance before heading into the MCG – it felt like such a slog to the turn around point and back and was only made better by seeing Jo and Maggi. I paused for a moment before I entered the MCG to take a picture and a breath – I remembered how much I loved this part of the run last time I ran this event and wanted to savour it. I’m pleased to say it was just as good second time around. Running a lap of the MCG is just spectacular, especially with people sitting in the stands cheering us all on. Even better, the first marathon runner was just coming in to the arena as I was finishing my lap so the crowd were cheering even louder…and I pretended it was for me to help get me over the line. I didn’t run a PB but I was really happy with my time, considering that 24 hours before, I’d been thinking of not bothering. Most importantly, my calf, foot and achilles all felt great, as they had throughout the run. And I had another fabulous event hanging out with a great bunch of running friends – what more can you ask for? I knew that I was going to be on holidays for International parkrun day* which meant that it was a perfect opportunity to fit in another bit of parkrun tourism. Albury-Wodonga fit with our itinerary so I turned up there on a stunning, sunny Saturday morning. I know there is a bit of a divide on this one but I’m definitely a runner who enjoys running while listening to music. It’s not that I can’t run without it – I’ve been forced to do that a couple of times (usually because I don’t figure out my iPod is flat until I turn it on). I just prefer to run with – it helps me zone out. I actually consider it to be white noise to a certain extent – I’m not always aware of the song that’s playing, it’s just blocking out world noise and stopping my brain from concentrating on anything other than moving and breathing.